WE GIVE ACADEMIC credit to students who prove they can create engaging content for online audiences. To guide their efforts, a portion of our curriculum unpacks the principles of fluency, authority and novelty. 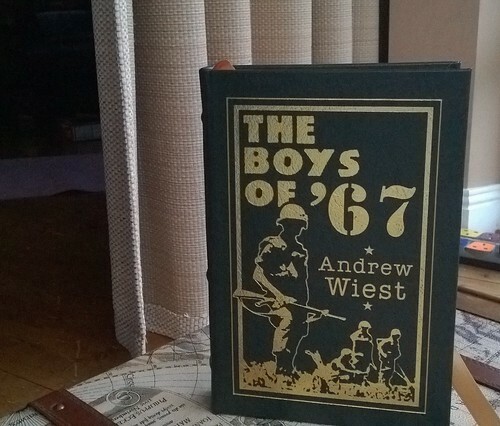 I point to traditional works such as The Boys of '67 (above) and the online writing of Dave Delaney and Dervala Hanley as examples of best practice in narrative. Andrew Weist is an approachable historian. Dave Delaney runs the vibrant New Business Network Radio. Dervala Hanley is an online diarist whose ghost work has elevated major brands. I HAVE 30 Moleskine notebooks full of clever words and phrases. I'm looking at ways of magnifying the words and displaying them on walls. I think words written by Media Writing students will personalise the hallways where our creative media students produce some of their best work. THE EUROPEAN UNION did a big favour for consumers by imposing limitations on mobile phone roaming costs. I saw the generosity of that favourable treatment when traveling from Ireland to the States for my mother's last days. I spent 21 days in the States. Because I talked to people in Ireland several times with updates to my mom's condition and funeral arrangements, I paid an average of 14 euro a day in roaming charges. I accept the pain of those charges along with the grief I felt when mom died. I HAVE DISCOVERED how easy it is to make 30-second stories come to life instantly with Lumia Storyteller, an app running on our Windows Phones. I embedded our Tipperary Morning Commute below with notes after the break. I use both a Lumia 1020 (the one that recorded the commute) and a Lumia 1520 (the handset that captured living images about Hess Trucks). I HAVE TO HAND BACK the Microsoft Surface Pro next week and I can already feel my loss of productivity. That was always going to happen because having the little tablet was meant to keep me working while a creaking Windows 7 laptop got a long stay in the maintenance bay. I've three quick observations worth sharing to anyone considering the jump to a Microsoft Surface. I AM WRITING a Last Will and Testament that specifies the use of a driverless hearse at my funeral. I think this specification would help jump start the industry segment. I believe autonomous cars are safer than cars driven by average (texting, talking, drinking) humans sharing tarmacadam with me every day. I want to arrive safely in the cemetery perhaps accompanied by an extra passenger (if no passive driver was required on the journey). WE BURIED MY mother, Evelyn Frances Goldbach, in the family plot today. In her memory, we have pulled together a five-minute video from dozens of photos she enjoyed viewing during her 88 years. This short video clip uses Mantovani's instrumental version of "Charmaine" as a backing track. The Mantovani orchestra enjoyed its first hit in the US charts in 1951. It peaked at #10 in 1952, the same time my mom and dad met each other the first time. They enjoyed hearing the song and sometimes began dancing spontaneously when they heard it on the radio. I have purchased five different versions of the song and am storing two of them on my blog as the backing track of the short slide show honouring my mother. View the 5:56 clip on OneDrive. MY MOM PASSED away at 0630 today and we are following her instructions for her funeral arrangements and burial next week. Along with my four brothers, we also plan to celebrate a few moments of joy when visiting mom's favorite haunts (like Eden Resort shown in the image). On a formal note, the obituary  specifies we will hold an open casket viewing in Andrew T. Scheid's funeral home  from 1900 to 2030 on Monday, January 12, 2014. Mom wrote down and prepaid all these arrangements more than a decade ago with Andy Scheid. Mom's funeral Mass is at 10AM on Tuesday, January 13, 2015, in St Mary's Roman Catholic Church, Lancaster, PA. It's minus five cold outside in Lancaster at the moment but people can park their cars in Andy Scheid's quiet place and stroll the 300 yards up the hidden alleyway to the church. Her burial is in the family plot of the St. Joseph New Cemetery , a place some readers might remember from other family events. You cannot walk from the church to the cemetery but if you're on Route 999 at noon on Tuesday, the 1971 black Mercedes hearse is taking my mother on a victory lap. I AM AT a major junction, looking straight into the sunset of life. Every one of my senses has made new discoveries.